A Life of Sugar and Spice: Brussels Sprouts, Bacon and POM = Wonderful! I love Brussels Sprouts. This poor veggie is one of the most hated of them all and it's such a shame. They are delicious!! I usually just buy them frozen, cook them in the microwave and eat with butter, salt and pepper. Over the past year or two I've seen a ton of recipes on the blogs involving these little nuggets of joy and more often than not, the recipe includes bacon and pomegranate of some sort. I've been wanting to try one of these recipes out for a long time but laziness has kept me from doing it. Last week the nice folks over at POM Wonderful sent me a case of their pomegranate juice. I thought this would be the perfect opportunity to try out one of those recipes. Typically I drink water and only water, but sometimes I just want something flavorful. I'm very picky about juice and it has to be 100% fruit juice. Sure, once in a great while I'll grab a cup of super sugary fruit punch from the fountain in the cafe... once in a very great while. The more I read about POM Wonderful on their website, the more I like them. You should check out their website! So anyway, I read a bunch of recipes and just kinda threw something together. I thought it came out ok, less liquid would've been better, but it was still pretty tasty! 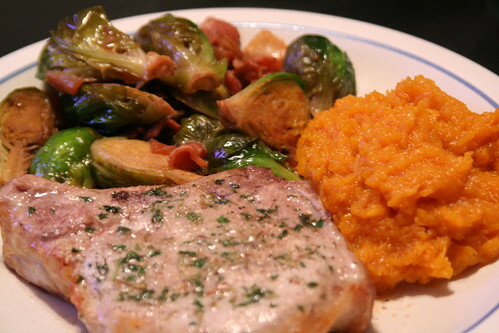 Served with some butternut squash and a pork chop, soooo good. I am loving the butternut squash this winter. My Mom has been serving butternut squash at Thanksgiving for as long as I can remember, but I refused to eat it up until about 3 years ago. Now I just love it!! Yeah, I just kinda dumped some stock and some juice in, it was too much. I can't tell you how much of each to put in, but there are plenty of recipes out there! Enjoy! I love those little things too. I'll buy a bag at the supermarket and eat them all myself. They're just so yummy! Hey Renee! It was the Sunday bacon but I don't know if it was the organic or natural version. I think I've tried both, this one was more crispy than the other though. I love it!